Civil rights pioneer and political trailblazer Vel Phillips died Tuesday at the age of 94. Phillips' life was a series of firsts as she broke gender and racial barriers. 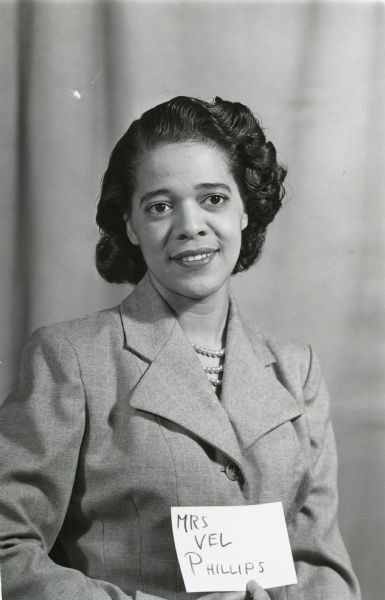 She was the first African-American woman to graduate from the University of Wisconsin Law School in 1951 . She was the first female and the first African-American elected to the Milwaukee Common Council in 1956 , where she pushed city leaders to recognize the inequalities facing minorities in the city, including housing discrimination. She served on the council until 1971, when she became the first female judge in Milwaukee County. "I just thought that I would have a chance to really make a difference," Phillips told Wisconsin Public Television in it's documentary, "Vel Phillips: Dream Big Dreams ." In 1958 she became the first African-American woman elected to the Democratic National Committee. Then, in 1978, she became the first female and the first African-American elected to a statewide office in Wisconsin: secretary of state. She beat eight other primary candidates. "My mother would always tell us if you really want it, don’t dream small dreams, dream big dreams," Phillips said in the documentary. Her son, Michael Phillips, told The Associated Press that she died in hospice care Tuesday. Phillips helped lead efforts to create more housing rights in Milwaukee and remained politically active into her 90s. In 1962 , Phillips introduced a fair-housing ordinance to the Milwaukee Common Council. It was rejected 18 to 1. Phillips introduced the bill several times between 1962 and 1967 , with her vote being the only one in favor. The proposal sparked a legislative battle and her voice on the common council served as one that represented people who she marched side-by-side with to fight for equal rights. In 1967, Phillips teamed up with the NAACP Youth Council and Fr. James Groppi in leading and marches for open housing that continued for 200 days. Met by counter-protesters, bricks were thrown, racial slurs were shouted and police used tear gas during one march that led to the Milwaukee mayor to ban future marches. But protesters and Phillips defied the ban and continued to march, and Phillips — who received threats and hate-filled letters, and who even had a bullet fired into her kitchen — was eventually arrested. "I felt nothing was going to stop us," Phillips previously said of the marches. While Phillips was petite, polite and charming, she wasn't to be overlooked. Following years of votes against her ordinance and almost a year of marches, the council finally passed a fair housing law in April 1968. Wisconsin Sen. Lena Taylor, D-Milwaukee, said Tuesday that it was because of Phillips that her parents could buy a house on Capitol Drive in Milwaukee. "She was to this day the only person of color that has been elected statewide office to a constitutional office in the state of Wisconsin," Taylor said. "She was little, but she was mighty and she was persistent." When Louis Butler was sworn in as Wisconsin's first African-American Supreme Court Justice on Aug. 25, 2004, Phillips was in attendance and spoke to reporters afterward about the pressure of being first. "Oh, it's tremendous, it really is. It sounds so glamorous and wonderful, but it's tough. It's just tough. And when you're a double-whammy like I was, the first woman and the first African-American, it's not easy at all," Phillips said. "There were many nights that you just cry yourself to sleep, but you keep going. It really makes you stronger. It makes you more dedicated, more committed, and it changes your whole perspective on things. Vel Phillips, left, sitting at a table next to her husband, W. Dale Phillips. Photo courtesy of the Wisconsin Historical Society. I could never have done some of the things that political people are doing today. It was just so — it's almost seductive. When people see you and believe in you and trust you and expect things of you. You just, you either fall by the wayside or your rise above it." Mordecai Lee, a political science professor at UW-Milwaukee, says Phillips was a role model that "wrote history" and helped open the doors for African-Americans. "I think we have to understand that even though she was a very gracious and soft-spoken person, very pleasant to be around, that inside her she was steel," Lee said. Born as Velvalea Hartense Rodgers on Feb. 18, 1924  in Milwaukee, she went to North Division High School and graduated from Howard University in Washington, DC in 1946 . In 1947, she met and married her late husband , W. Dale Phillips, who was a lawyer. After graduating from Howard University, the couple moved to Milwaukee before both attending UW Law School, where the two became the first African-American couple to graduate from. Then after graduation and before Phillips became a city leader, the two opened Phillips and Phillips Law Office. W. Dale Phillips died April 14, 1988 from a heart attack, bringing Vel's plans to run for Congress to an end. But Vel never stopped pushing for equality and advocating for others because she believed civil rights were human rights. She created the Vel Phillips Foundation to encourage access to higher education, and she was the honorary chairwoman of the congressional campaign for now U.S. Sen. Gwen Moore, D-Milwaukee. On Wednesday, Moore called Phillips her "champion" who was there for her. Several members from Milwaukee's Common Council gathered Wednesday in the Milwaukee City Hall Rotunda to remember Phillips. Among them was Alderwoman Milele Coggs who on Tuesday helped create a Vel Phillips Trailblazer Award. "We decided to go ahead and do the award in the timing that we did because of a strong belief that people should get their flowers while they're living," Coggs said Wednesday. Coggs said while Phillips died a few hours after the award was finalized, Phillips' lessons will live on. Coggs recalled a time in 2008 when she was sworn in. She went to city hall with Phillips and learned she had her old office. "She was in that office primarily because her white male counterparts did not want to office share with her ... But she took pride in having that office to herself," Coggs said. "It made me sit in that office for four years — the smallest office down here — with a little bit of pride, sharing that history and legacy with her." Phillips faced a lot of uphill battles, but she did so with grace, many people said Wednesday, including Taylor. "(She) is a rose that grew out of the concrete, so to say, of Milwaukee that had nothing but class and grace but had to fight the racism that existed in this state, and was a trailblazer for so many," Taylor said. Gov. Scott Walker honored Phillips on Wednesday by remembering a moment in 2009, when Milwaukee County's Children's Court Center was renamed the Vel R. Phillips Juvenile Justice Center . Walker was county executive at the time. Milwaukee County District Attorney John Chisholm tweeted Tuesday night his condolences to Phillips’ family, including her son Mike Phillips, who is a prosecutor in Milwaukee County. Saddened to learn that Vel Phillips, Wisconsin's first African-American judge and statewide official, passed away this evening. My deepest condolences to her family, including my colleague Assistant District Attorney Mike Phillips, who continues his mother's work for justice. On Wednesday morning, Senate Minority Leader Jennifer Shilling, D-La Crosse, sent a series of tweets, calling Phillips a "true pioneer and leader during the civil rights movement" who "fought to improve social and economic justice for underrepresented communities." It is with a heavy heart that I learned of the passing of Vel Phillips. My father worked for Vel when she served as Secretary of State, and I met her several times as a young girl. At the time, I had no idea how much of an icon and giant she was in terms of her accomplishments. When asked why there aren't more African-American's holding statewide offices in Wisconsin, Lee said that's a hard question to answer, but sees progress in Mahlon Mitchell, an African-American, running for governor . "It’s really hard to know what the answer is, but when one person proves that it can be done that’s just such an enormous accomplishment. Now that there’s an African -American running in the Democratic primary for governor, I don’t even think it raises an eyebrow." Editor's Note: This story was last updated at 5:08 p.m. Wednesday, April 18, 2018. Chuck Quirmbach, Shawn Johnson, Laurel White, Brady Carlson, Rich Kremer and Andrea Anderson contributed to this report.